This month, Worcester became the first East Coast city to introduce ofo bikes. Look out, Hubway, there’s a new bike-share company in town. Two cities outside of Boston have signed on to test out ofo, a Beijing company that lets riders rent bikes for an allotted amount of time but doesn’t require customers to return the bikes to a docking station, as its competitors do. Joe Gravellese, a spokesman for Revere Mayor Brian M. Arrigo, said the city will experiment with ofo for the next several weeks, at no cost to taxpayers. He said representatives from ofo approached Revere about launching a pilot program, and the city was quick to agree — especially because ofo is picking up the tab for both the staffing and the bikes. “We think it could be a great thing for our residents, especially those who either don’t live right near one of the MBTA stops and want to make that connection to transit, or want to be able to make car-free trips for groceries or other errands,” Gravellese said in an e-mail. Ofo will roll out 200 of its bright yellow bikes Oct. 2, according to Revere officials, with the possibility of expanding the program next year if the pilot is successful. Earlier this month, Worcester became the first East Coast city to introduce ofo bikes, and the second in the country, officials said. Seattle was first. 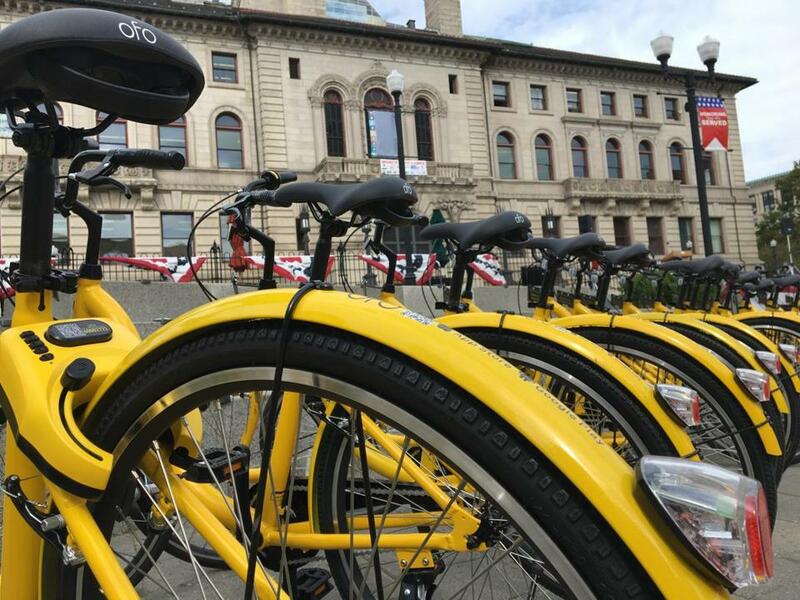 Ofo (pronounced “Oh-Foh”) put 400 of its yellow rides on Worcester’s streets with the support of the city, and it plans to add more bikes after the winter. “It’s actually been pretty popular,” city spokesman John Hill said. The city plans to install additional bike racks to accommodate the expected surge in ridership. In its quest to attract users, the company seems to take potshots at docking stations like those used by Hubway, which requires the customer to return a bike to a designated spot, rather than simply pull up to a destination and lock up the bike near there — either in a “preferred parking zone” the company has identified or in a legal location on public property. Hubway operates in Boston, Brookline, Cambridge, and Somerville. To use ofo, customers must download an app, which shows on a map where a bike can be picked up. Once a bike is located, the user taps the “unlock” button and then scans a barcode on the bike to release it, according to the company’s website. Locking up the bike when a user is finished ends the trip. It costs $1 per hour to use ofo’s system. Payments are made through the app. The company said it’s in final negotiations with at least two more Massachusetts municipalities that have expressed interest in the system. 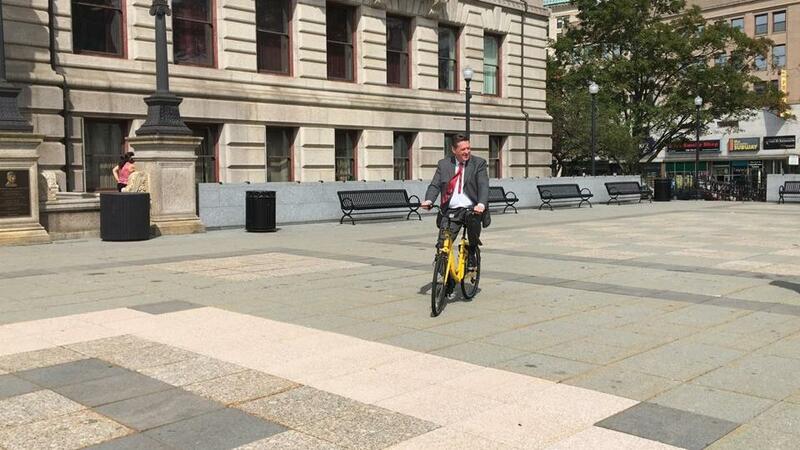 City Manager Edward M. Augustus Jr. tried out an ofo bike.